If you want to enjoy the lifecycle of caterpillars – pupa – butterfly again, you can breed your butterflies! For some species this is easy, for others it can be harder. 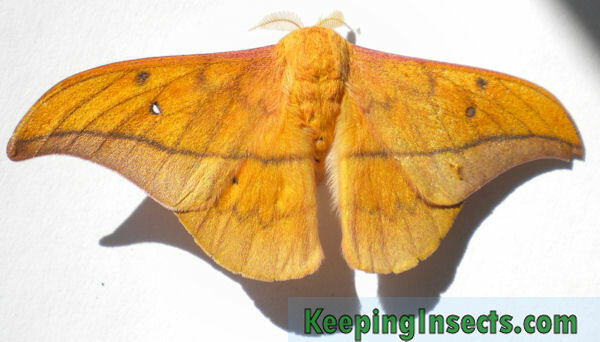 To breed butterflies you need a male and a female, butterflies are generally not parthenogenic (except the silk moth Bombyx mori). To know the differences between males and females, you can find pictures in the caresheet of the species you have. Most butterfly species are extremely sensitive to inbreeding. After one or two generations of breeding with brother-sister pairs, the butterflies will be weak and small and cannot reproduce anymore. Therefore you have to breed individuals that came from different parents. Make sure the male and the female have the appropriate environmental temperature, appropriate and enough food and enough space. When all is well, you will see mating pairs of butterflies. When butterflies mate, a male and a female are attached to each other at the abdomen, both facing the away from each other. This can take half an hour to 8 hours. Make sure not to disturb the animals in any way. Almost immediately after mating the female will find a place to lay her eggs. She perfers to lay the eggs on the leaves of plants that the caterpillars will eat. By placing these leaves in the enclosure, you will give her a target and help her to lay eggs quickly. When you do not provide leaves, she will lay her eggs anywhere. As soon as the eggs are laid, let them dry for 3 to 8 hours and then pick them up or move them with a brush carefully. When they are attached to a leaf you can take them away immediately be removing the whole leaf from the enclosure of the butterflies. But the eggs in a ventilated box with tissue paper on the bottom. Make sure this paper stays a bit moist and maintain a relatively high humidity inside the box. Do not give mold a chance; make sure the ventilation is enough to dry the insides of the box before you mist the eggs again. Keep the box at an appropriate temperature for your species of butterfly. When the caterpillars are born, they are extremely small and delicate. Touching them with your fingers or moving them can be lethal. Without touching them, or by touching them with a light brush, take them out of their hatching box and place them into the place where you want to raise your caterpillars. 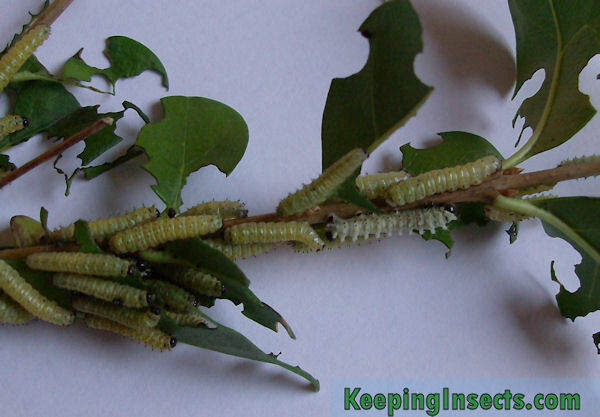 It is best if all caterpillars in this ‘raising enclosure’ are the same age or instar. Very young caterpillars need more humidity than older instars. Feed your newborn caterpillars fresh leaves and treat them as stated in the care part of this website.